It's been a busy week for boating. 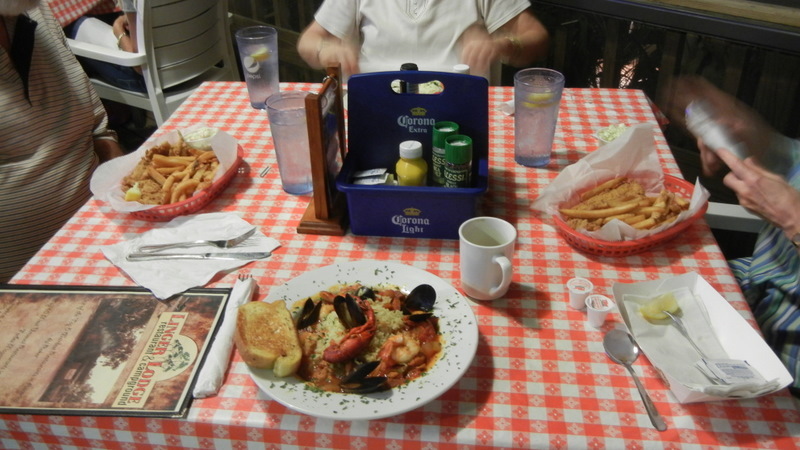 Monday we had lunch with CruiseGuide writer, Fred Myers, in Cape Coral at Perkins. While in the restaurant, Great Loopers Bob & Ann came by. 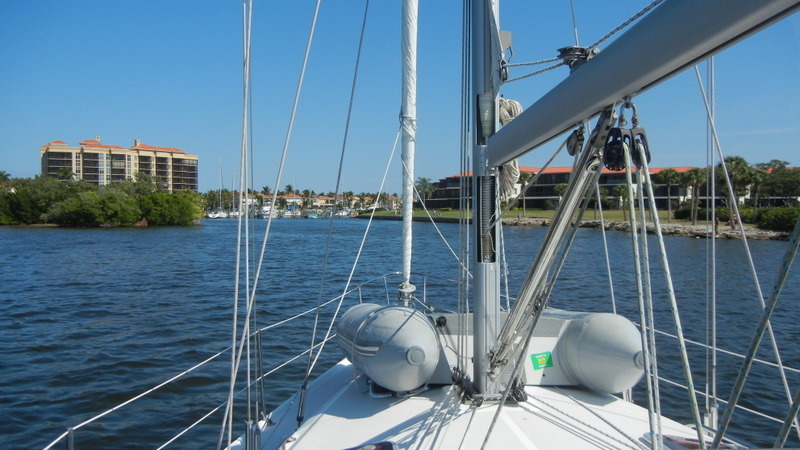 They are spending the winter in Cape Coral on their 42 ft catamaran. It seems there are so many Loopers in Florida there are get-togethers with groups that cruised together.Then it was on to Burnt Store where we dry camped in the parking lot behind Hans and Ria's condo. Wednesday Hans and I went out for a cruise on his 36 Catalina sail boat. The weather was perfect with a steady 10kt wind. Charlotte Harbor is one of the best places to sail in the country. It is about 10 miles square with no Gulf swells and about 10 ft deep throughout. 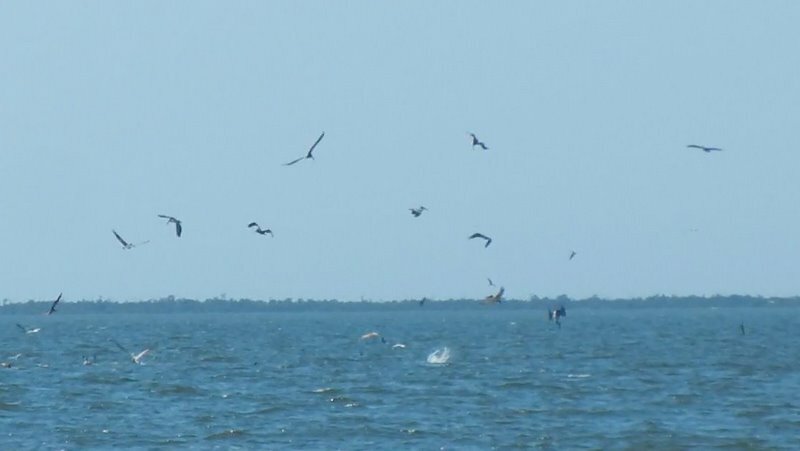 At one point a flock of pelicans discovered a school of fish near the surface and bedlam began with the pelicans diving straight down. That night we ate at a new Thai restaurant in Port Charlotte. It was very good and for the first time in years I had fried ice cream for dessert. 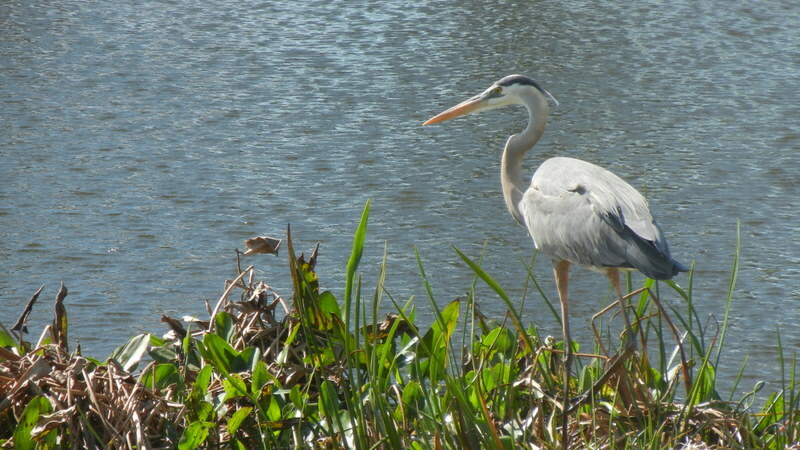 In Bradenton we stayed with former Kenlake boaters Doc and Eileen. We had dinner at Limber Lodge an old Florida backwoods restaurant decorated with stuffed alligators, snakes, fish and other animals. This past weekend we stayed in the driveway of new friends, Gary and Carol at their Anna Maria home. 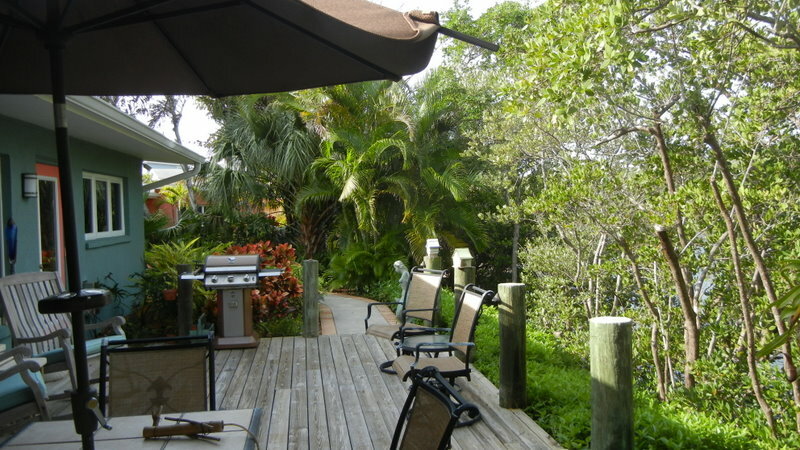 This town is old Florida with modest homes, long beaches, and a beautiful breeze. Gary just retired, sold everything in Nashville, and will live here most of the year except when cruising. I came to help him learn his 1991 Grand Banks 36 ft Classic trawler. We spent most of the day going through the boat and finding where everything was hidden. With 2 engines there is a lot more stuff and fewer places to put it. The engine room is a masterpiece of compact design. It took most of the day to find the 30 gallon holding tank which turned out to be under the Northern Lights generator. Gary bought the boat from a man who spared no expense in equipping it. I also got a chance to play with a Garmin 5000 series chartplotter. After 2 hours we gave up trying to set an offset on the depth sounder. We measured the depth and finally determined the 3.9 ft reading meant there was 1.1 ft under the keel. There is a long learning curve to these integrated chart plotters that put radar, charts, depth sounder, weather, music, TV all into one screen. It was windy and we never felt like going out. 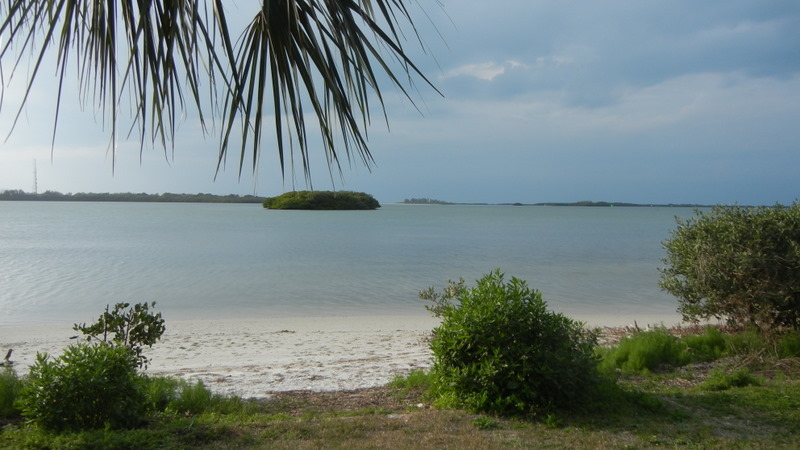 Today we left early afternoon and are camped at Fort De Soto CP. 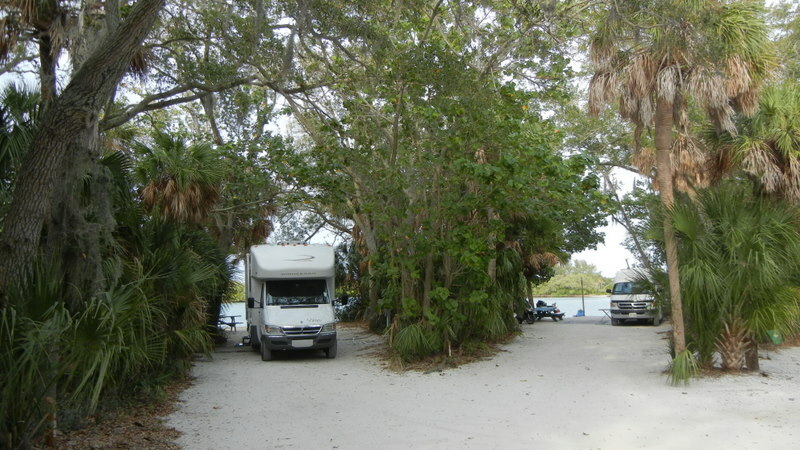 This is a beautiful place with campsites in tropical woods right beside a beach. It is full with many RVs that stay for 2 weeks. I lucked out getting a reservation this morning as we needed a pump-out before heading to St Petersburg in the morning.